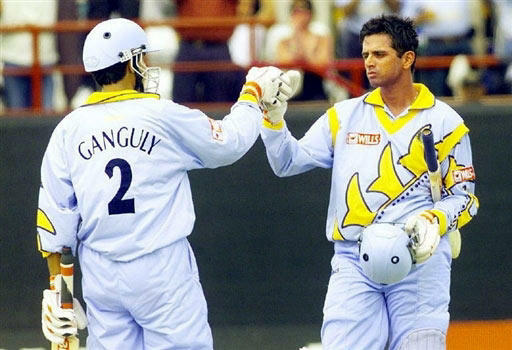 Sourav Ganguly and Rahul Dravid’s massive partnership of 318 runs versus Sri Lanka at Taunton in the 1999 World Cup tops the chart for the highest partnership by runs in World Cup history. That stand helped India post 373 for 6 in 50 overs and eventually the team went on to win the game by a huge margin of 157 runs. Coming in at number 2 is the 282-run stand put up by the Sri Lankan opening pair of Upul Tharanga and Tillakaratne Dilshan versus Zimbabwe at Pallekele in the 2011 edition of the tournament. Dravid once again features at number 4 spot for his partnership of 237 runs with Sachin Tendulkar against Kenya at Bristol, once again in the 1999 edition. Ricky Ponting and Damien Martyn's World Cup winning stand of 234 runs in the final of the 2003 World Cup versus India at Johannesburg comes in at number 5; the Lankans Tharanga and Dilshan make yet another appearance at number 6 with a stand of 231 runs. The Waugh brothers come in a number 9 for their partnership of 207 runs versus Kenya at Visakhapatnam in the 1996 edition, while yet another pair of Australia batsmen – Michael Clarke and Brad Hodge – complete the list with their tally of 204 runs against the Netherlands in the 2007 World Cup in the Caribbean.